Here are some FAQ (frequently asked questions) we get asked about the software and technical support services we offer. If your question isn’t on this list or you still have questions after reading this FAQ, please contact us and we’ll get back to you with an answer. FaxTalk is advanced and easy to use fax software you install on your Microsoft Windows based computer allowing you to send and receive faxes directly from any application on your Windows desktop. What the difference between FaxTalk and on-line faxing? FaxTalk provides a cost effective method of sending and receiving faxes. Online fax services charge you for each fax you send or receive, and they can also charge a monthly service fee. There are no monthly fees with FaxTalk. With FaxTalk, faxes are transmitted using your telephone lines and are never routed via the public internet (unless you choose to forward your faxes via e-mail). What are the requirements for FaxTalk? FaxTalk software requires a fax modem connected to a telephone line. It will work best with traditional telephone land-lines and many cable based telephone services including AT&T, Verizon, Vonage, Comcast, Rogers, Telus, Cogeco, Videotron and others. It can also work with many dedicated VoIP telephone services such as Vonage, BasicTalk, MagicJack, Oomla, NetTalk and others. 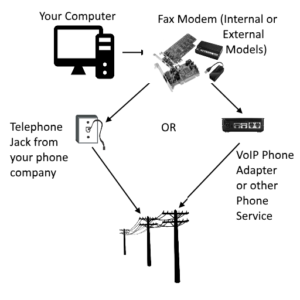 If you have a VoIP SIP account, it can also work with an ATA (Analogue Telephone Adapter) connected to a fax modem. Consult your VoIP provider terms of service, fax service availability and reasonable use policy for more information. FaxTalk is designed for use with Microsoft Windows and supports 64 bit and 32 bit versions of Microsoft Windows 10, 8, 7, Vista, Server 2012, 2008 and 2003 and Microsoft Windows XP (w/SP3). What is FaxTalk Fax Merge software? FaxTalk Fax Merge is an add-in for Microsoft Word. It is an optional component that can be purchased with the FaxTalk software. To use the FaxTalk Fax Merge option, you’ll require FaxTalk software and compatible version of Microsoft Word (32-bit). The FaxTalk Fax Merge add-in is not required to send faxes directly from Microsoft Word, but when installed in Microsoft Word it will provide you with time saving icons for quick faxing and the ability to perform powerful fax mail merges using your fax database (from Excel, Outlook, or other Microsoft Office compatible connected database.) Microsoft Word must be 32 bit version for add-in compatibility. Do businesses still send and receive faxes? Many businesses today rely on faxing and every business should have the ability to send and receive faxes even if faxing is not part of their everyday operation. Many legal, financial, health care and government entities use fax to transmit signed legal documents. Whether you send a few faxes or hundred of faxes a day, FaxTalk is your low cost and long term solution to faxing. You don’t pay fax service fees and you don’t have to change your existing fax number or get a new one. Does FaxTalk fax software work on my Mac or VM? FaxTalk is designed for use with Microsoft Windows and it supports 64-bit and 32-bit versions of Microsoft Windows 10, Microsoft Windows 8.x, Microsoft Windows 7, Microsoft Windows Vista, Microsoft 2012 Server, Microsoft 2008 Server, Microsoft Windows 2003 Server and Microsoft Windows XP (SP3). Some Macs may operate the Microsoft Windows OS, but we’re not experts in the Mac hardware or software so we can’t guarantee the software will work properly on a Mac computer. We don’t officially support the software on a Mac that is operating Microsoft Windows. Due to possible compatibility issues, we don’t support using FaxTalk on a virtual machine (VM). Does FaxTalk software work in my country? FaxTalk works in most countries around the world that we are authorized to sell to. Due to licensing agreements, we can only distribute the FaxTalk software in specific countries. If your country is not listed in the billing and shipping options of the check-out process then we do not sell or provide services in your country. What is the difference between FaxTalk FaxCenter Pro, Multiline Server and Messenger Pro editions? FaxTalk is advanced and easy to use fax and voice answering machine software you install on your computer, allowing you to send and receive faxes directly on your Windows desktop. FaxTalk FaxCenter Pro is designed for a single telephone fax modem and for faxing only. FaxTalk Messenger Pro is designed for a single fax modem and includes faxing and voice mail (answering machine) support when used with a compatible voice/fax modem. FaxTalk Multiline Server is designed for up to 8 (fax/voice modems) and supports both fax, voice answering machine and fax and phone book sharing across your local network. Can I send a voice broadcast with FaxTalk? No, FaxTalk does not support voice broadcasting but FaxTalk Messenger Pro and FaxTalk Multiline Server both support voice answering (voice mail) and fax on demand capabilities when used with a compatible fax/voice modem. Is FaxTalk available at my local computer retailer? No, FaxTalk software is sold on-line only, it is not available in computer and software retail outlets. GetFaxing.com is an authorized valued added re-seller for FaxTalk software on-line. Can you mail me a CD-ROM of the software? Yes, we offer this option at the time of purchase, or within 30 days of your original purchase. It may take up to 30 days for postal delivery of your CD-ROM. We provide a download link usually within 24 hours and the CD-ROM is mailed out a few days later. There is a nominal fee to cover the cost of the CD-ROM and for shipping. Sorry, we do not offer or mail out TRIAL CD-ROMs. Can I try the software before I buy it? Yes, we recommend you try the 15 day trial version that you can download for free. To install and use the software, you will require a fax modem connected to a telephone line. See the requirements for more info. For more information please visit our TRIAL page. How do I activate the trial version after purchase? The FaxTalk trial will expire after 15 days of usage. When you purchase the FaxTalk software, you will receive a download link via e-mail (and CD ROM in the mail if purchased at checkout) that can be installed over the existing trial version. All trial limitations are removed and existing contacts and faxes created within the trial version are copied and carried over to the retail version. Can I try the software for more than 15 days? The trial will expire after 15 days, if you need additional days for evaluation please contact us. For more information on the trial please visit our TRIAL page. Are there any monthly fax fees or other charges? FaxTalk is not a subscription fax service. There are no fees when sending or receiving faxes as you are using your existing telephone line. Any charges for local and long distance calls (if they are not included in your calling plan) are billed by your telephone provider. Once purchased, there are no charges for use of the FaxTalk software and you are allowed unlimited usage on each licensed computer. Will you provide me a fax number? No, you require an existing telephone line that is assigned to a telephone number to use the FaxTalk software. FaxTalk requires a telephone line and a compatible fax modem to send and receive faxes. See FaxTalk requirements for more information. What’s the difference between FaxTalk and an internet ‘cloud’ fax service? An internet fax service will charge you for each fax you send or receive, or you pay a fixed rate each month for a limited allowance of faxes and storage fees. With an internet fax service, faxes are routed through a third-party (the internet fax service provider) and then they use their own ‘Fax Server’ software to transmit the faxes using VoIP technology. If you transmit or receive many faxes, you could be paying hundreds of dollars in fees. In addition, internet fax services will assign you a new fax number or allow you to port your existing dedicated fax number to them. They then control and/or may take ‘ownership’ of your dedicated fax number. This can sometimes cause problems if the company goes out of business or you want to port your number to another provider. In addition, faxes are not sent in real time, they are delivered to the internet fax service and sent at their schedule. Each outgoing fax is placed in an outgoing queue and service times are based on outgoing line availability that is shared among all subscribers to the service. While this type of service may be convenient, costs can add up quickly for low usage or over-usage. FaxTalk is not a subscription fax service. There are no fees when sending or receiving faxes as you are using your existing telephone service. Any charges for local and long distance calls (if they are not included in your calling plan) are billed by your telephone provider. Once purchased, there are no charges for use of the FaxTalk software and you are allowed unlimited usage on each licensed computer. Can I send faxes with FaxTalk using my internet fax service? No, FaxTalk does not support internet fax services. FaxTalk requires a telephone line and a compatible fax modem to send and receive faxes. See FaxTalk requirements for more information. My computer doesn’t have internet access, can I still use FaxTalk? Yes, one of the benefits is that FaxTalk does not require internet connectivity to send or receive faxes. You can isolate a computer from the internet and still be able to send and receive faxes using standard POTS (plain old telephone service). If you purchase the download-only version, you can download the software from another computer and install on your non-internet connected computer by copying the downloaded file to a USB Storage, portable hard drive or CD-R. We also provide an optional CD backup for purchase. Do I need a dedicated fax telephone line? No, but a dedicated line is recommended if you send or receive many faxes. You could setup FaxTalk to use your existing voice line or credit-card authorization phone line and activate it only when you need to send and receive faxes. Some land-line telephone companies offer a low-cost 2nd line option that uses the same phone line but has a distinctive ring signal. FaxTalk can be configured to only answer calls when that specific ring is detected. Contact your telephone provider for more details on available options. Do I need a land-line? You’ll need a telephone line that produces a dial-tone. It can be a traditional land-line from a phone company or a land-line provided by your cable provider. It can also be a VoIP type line connected to an ATA device provided by many of the internet and VoIP providers but results may vary with these type of devices as they are dependent on the provider and your internet connection speed. If your telephone line can generate a dial-tone, you can connect a fax modem and use FaxTalk software with it. Please check with your provider to determine if the telephone line supports fax transmissions. Wireless phone lines and satellite phone lines are not recommended or supported. Can I fax using BasicTalk, Vonage, MagicJack, Oomla, NetTalk or other type of internet to analogue phone device? Yes, but performance may vary with these type of telephone services due to your local internet speed, configuration and network traffic. Some VoIP telephone services are not reliable for faxing or may have faxing capabilities disabled. Check with your TOS (Terms of Service) and reasonable use policy included with the device you are using to determine if faxing or broadcast faxing is permitted. Can I fax using a (SIP Trunk Account) VoIP telephone service? Do I need a fax modem when using VoIP (SIP trunk account)? Yes, a fax modem is required. You plug in the fax modems telephone RJ-11 connection to a free RJ-11 port from your Analogue Telephone Adapter (ATA). Performance may vary with VoIP due to your local internet speed, configuration and network traffic. You should make sure that your default/preferred codec on your ATA device is set to G.711 or if supported T.38. Here is a list of some ATA devices. Can I fax using a Wireless Home Phone service? Check with your wireless phone service provider if faxing is supported. Most cell phone home phone services do not support fax. We’ve found that faxing is unreliable with cell phone service. Can I fax using my mobile cell phone? FaxTalk requires a fax modem to be configured and detected in Microsoft Windows. Most current smart phones do not have the ability to be configured as a fax modem, so it is not possible to use FaxTalk to send a fax directly with your mobile phone. You can forward received faxes to your e-mail as a PDF document, so you can view received faxes on any phone or device that can view PDF documents. Can I use the modem supplied by my phone or cable company with FaxTalk to send and receive faxes? No, FaxTalk requires a fax modem to be configured and detected by Microsoft Windows. The modem supplied by your phone company or cable company may be called a ‘modem’ but it is not a ‘fax modem’. The modem they install provides you with internet service and/or phone service. Some of these modems can also provide the television reception to a DVR or HD Receiver that is connected to a television. To use the FaxTalk software, you will require a separate ‘fax modem’ that is connected to your computer and a telephone line. If your cable modem provides telephone service, you can connect the telephone RJ-11 jack of the ‘fax modem’ to the RJ-11 telephone jack of your internet/phone modem. I have DSL modem plugged into the telephone. Can I use that? A DSL (DSL/ADSL/VDSL) modem is not a fax modem, so you cannot send or receive faxes using this type of modem. You can continue to use the DSL modem for your internet service, but you will still require to install a fax modem on your computer to use FaxTalk. What is a fax modem? A fax modem (often called a dial-up fax modem) is a device that connects to your computer and telephone line. It can be used for data transmissions and for sending and receiving faxes. Fax Modems are available in easy to install USB type, internal (slot) that is installed inside the computer, and external powered models that plug into a serial port. Cable and DSL modems are not fax modems, and the fax built-in with some All-In-One printers are not considered fax modems so these cannot be used to send or receive faxes with the FaxTalk software. How do I determine if I have a fax modem installed on my computer? A fax modem (often called a dial-up fax modem) is a device that connects to your computer and telephone line. It can be used for data transmissions and for sending and receiving faxes. Fax Modems are available in easy to install USB type, internal (slot) that is installed inside the computer, and external powered models that plug into a serial port. In Microsoft Windows, go to Windows Control Panel and double-click the Phone & Modem settings. Click on the Modem tab to determine if a fax modem device is listed here. If you do not see any devices listed here then you do not have a fax modem installed on your computer. If a device is listed, verify if the model listed supports fax. FaxTalk will support many Class 1 and Class 2 type fax modems. If you are unsure, e-mail us with the name of the device listed and we will try to assist. NOTE: Cable and DSL modems that are supplied by your phone or cable company are not fax modems, and the fax built-in with some All-In-One printers are not considered fax modems so these cannot be used to send or receive faxes with the FaxTalk software. Where can I buy a fax modem? What fax modem do you recommend? We recommend purchasing a hardware based or controller-less fax modem. Avoid software based or ‘soft-modems’, ‘Win modems’ or ‘KFlex’ type modems. Can I send or receive faxes when the computer is off? No, the computer must be turned on, the fax modem active and the FaxTalk software set to answer incoming calls to receive faxes. Can I send or receive faxes while the user is logged off or system is locked? Yes, FaxTalk installs a service that is always active in the background. You can continue to receive and send queued faxes while the computer is logged off. Can I send faxes from my custom software? Yes, FaxTalk includes a dedicated fax printer driver that you can use to ‘print’ any document from any application in Windows. Instead of printing the document, it will be faxed to the recipient(s) you choose. Can I receive faxes in PDF format? Yes, FaxTalk can be configured to save a copy of all incoming faxes in PDF format to a specified folder of your choice. How many faxes can I send at once? FaxTalk allows you to schedule and group faxes together to be sent in batches. Each fax is sent sequentially to the recipient and they are stored in an ‘outbox’ queue. If you use a single fax modem (standard setup with FaxTalk FaxCenter Pro or FaxTalk Messenger Pro software) you can send one fax at a time. Each fax in the queue will transmit automatically until all faxes have completed or the retry limit is reached. As a rule of thumb, each fax transmission will take approximately 1 minute per page. Pages with detailed images or shading may take longer. With FaxTalk Multiline Server, you can use multiple modems connected to separate phone lines, so you can send multiple faxes at the same time. Please note that the FaxTalk software should not be used for unsolicited faxing or ‘fax spamming’ and we will refuse sales and support for customers intending to use the software for illegal spamming purposes. Is there any limit to the faxes I can send or receive? No, there are no limits to the number of faxes you can send or receive. As a rule of thumb, a single fax page can be transmitted in about 1 minute. On average, you can send or receive approximately 1000 pages per 24 hour period when using a single telephone line and single fax modem. Please note that the FaxTalk software should not be used for unsolicited faxing or ‘fax spamming’ and we will refuse sales and support for customers intending to use the software for illegal spamming purposes. Yes, As a rule of thumb, a single fax page can be transmitted in about 1 minute. On average, you can send or receive approximately 1000 pages per 24 hour period when using a single telephone line and single fax modem. With the FaxTalk Fax Merge Add-on, you can sent fax mail merges using Microsoft Word. Please note that the FaxTalk software should not be used for unsolicited faxing or ‘fax spamming’ and we will refuse sales and support for customers intending to use the software for illegal spamming purposes. Do you sell fax lists or a fax database? No, we don’t and we don’t recommend using purchased fax lists. Generally, these lists are out-dated and contain out of service fax numbers. This is unsolicited faxing and could be considered spam under anti-spam laws in your country. The FaxTalk software should not be used for unsolicited faxing or ‘fax spamming’ and we will refuse sales and support for customers intending to use the software for illegal spamming purposes. If you do intend to use a fax list, you must follow your local state, provincial or countries laws. If you have a list that includes voice numbers, it’s recommended you call each client, tell them why you’re calling and ask for their updated fax number and permission for you to send them a fax. If you are a legitimate business and have an product or service that is beneficial to the recipient then most businesses will allow you to do this. Do I need a fax machine to use FaxTalk? Can I keep and still use my fax machine? Yes, some of our customers use the fax machine and FaxTalk together on the same telephone line by using a telephone splitter. While you can use both, they operate independently. We recommend setting your fax machine to answer calls in 3 or 4 rings, and FaxTalk set to answer in 2 rings. If your computer is turned off, you can still receive faxes on the physical fax machine but they will not be stored or displayed in the FaxTalk software. Can I use my All-In-One printer that has a built in fax? You can use your All-In-One printer for printing of your faxes or for scanning your documents, but you cannot use the printers fax sending or receiving capabilities with FaxTalk. These types of printers use a proprietary fax software that is bundled with the printer. FaxTalk is not an internet fax service, it works much like a standard analogue telephone based fax machine in your office but has advanced capabilities such as automatic forwarding of faxes via e-mail, automatic printing, long term viewing and storage etc. HIPAA compliance requires that you have appropriate security safeguards in place that are administrative, technical, and physical in nature. For example, the physician should use policies and procedures that require office staff to verify the recipient’s fax number and use a cover sheet that does not include protected health information or when automatically printing received faxes, they are in a secure physical location. For HIPAA compliance with FaxTalk, you should use a standard analogue telephone line connected to a fax modem and do not automatically or manually forward any protected health information via e-mail unless using a HIPAA secured method of transmission. Using internet based/VoIP transmission of protected health information that is routed via a third-party may not be considered HIPAA compliant, so verify if using such as service would not violate HIPAA. Yes, if you purchased your software from us directly we provide 6 months (180 days) of technical support included at no extra charge to help you with any setup or questions of the software. We can also do the setup for you, we offer optional installation services and out-of-warranty support for products no longer covered by our support plans or support plans from other vendors. If your purchase was made directly from Thought Communications or another on-line re-seller, we can provide you our Remote support services. Monday to Friday from 8am to 5pm Pacific Time (North America). Our remote support services may accommodate your service requirements outside these hours. We respond to most e-mails within 24 hours Monday to Friday during business hours. Can you call me for help or to answer some of my questions? We don’t offer phone support or provide call backs. Most basic pre-sales questions should be answered in this FAQ section. If not, please e-mail us for support or sales inquiries. You’ll find we have a quick response time. We usually respond to most e-mails within a few hours during normal business hours and most within 24 hours. Our fax number is +1 707 440 2708. You can send us a test fax anytime, or if you have a question you’d like to send us by fax please do so. Please include your preferred response via e-mail or fax. We don’t offer phone support. You’ll find we have a quick response time via e-mail. We usually respond to most e-mails within a few hours during normal business hours and most within 24 hours. Are you the same company as (FaxTalk.com) Thought Communications? No, we’re a separate entity. We’re authorized by Thought Communications as value added re-sellers of the FaxTalk software and we are a third-party publisher of software add-ins for FaxTalk software. I bought my software from FaxTalk.com or from another vendor, can you provide me free support? Our priority is to our customers that purchase products and services directly from us. We don’t receive any compensation when your purchase is made directly from the trial software, from the FaxTalk.com web site or from another vendor. You’re welcome to use any of the free support documents on our Web site. If your original point of sale does not support your purchase, please visit our on-line store for our paid Remote Support options. Do you offer free upgrades or updates? If you are an existing customer of GetFaxing.com and you find and report a problem to us with the software and an update is available, we will provide you the update at no charge to you. If you have an older version that has been discontinued, or has been superseded by a new version we can provide you the newer version at a discount (discounted upgrade pricing). How much does to cost to upgrade to a new version? If you are an existing user of FaxTalk software and are using a version that has been superseded by a newer version we can provide you the upgrade version at a discount off the regular pricing (discounted upgrade pricing) contact us for more details or visit our store for updated pricing. You do not need to be a previous customer of GetFaxing.com to obtain upgrade pricing from us. I have an older version of FaxTalk Multiline Server, can I upgrade? Yes you can but please note that any optional FaxTalk clients used to connect to the FaxTalk Multiline Server will also need to be upgraded to the same version level. Contact us for special pricing. Can you import my old WinFax PRO data, or fix my existing WinFax PRO software? Yes, we’re WinFax experts and have over 20 years experience in the software. We can fix your existing installation of WinFax (providing you have it installed in Windows XP SP3 or later) or we can export your faxes and phone books for use with FaxTalk software. Contact us for more information. My country isn’t listed at checkout, why? We are authorized to distribute the software in certain geographical markets only. Unfortunately, if your country isn’t listed in the drop-down option at check-out, then we do not offer our products or services in your country. We accept most major credit card payments directly from our secure Web site https://www.getfaxing.com. We also accept payments by PayPal, so you can use your preferred PayPal payment funding source such as Debit Card, American Express, Discover, MasterCard, Visa etc. We currently accept USD (US Dollar) and CAD (Canadian dollar) at current USD exchange rates. My order failed or was cancelled at checkout, why? We use multiple payment gateways that accept different types of credit card payments depending on the currency you select (USD vs. CAD). Orders can fail if you attempted to complete an order with a non-supported type of credit card or if the credit card was declined. If you are using a credit card that is not VISA or MasterCard, use the PayPal payment method. A PayPal account is not required to make payments with a American Express, Discover, MasterCard, Visa etc. Orders can also fail if your billing address entered at checkout does not match your credit card billing address on file. For failed orders using PayPal payment, we recommend contacting PayPal directly to verify your PayPal account or credit card. If you continue to experience problems completing an order please contact us for more information. Can I install the software on multiple computers in my home or office? You will require to purchase a license for each machine you can install on multiple computers in your home or organization. If you are purchasing 2 or more additional licenses for multiple computers in your home or business, contact us for multiple license discounts. I lost my software and/or my serial number. Can you re-send it to me? The FaxTalk software should not be used for unsolicited faxing or ‘fax spamming’ and we will refuse sales and support for customers intending to use the software for illegal spamming purposes. We offer a 30 day money back guarantee on everything we sell unless specified at time of purchase. If you are not satisfied with your purchase, contact us within 30 days and we’ll make it right. Prior to purchase of the software, we suggest you download and install the TRIAL version of the software to ensure the software is right for you. We can assist you with any questions you have during your trial period. If you have any problem with your order it is important that you contact us first and not your credit card provider. Failure to contact us will result in delays in processing your return or refund, and may result in additional processing fees. We do not provide refunds for software, hardware or support services after 30 days unless it was previously authorized by us. For any physical products, we do not refund any shipping costs to return product back to us. We may charge you a restocking fee for items returned without the original packaging or components. When returning software, you are required to complete and sign an LOD (Letter of Destruction) form for digital media and physical media and you must return any purchased back up CDs if applicable before a refund is processed. Read our full refunds and returns policy here.